It was a clear day, warm enough to eat outside. Sixth avenue was buzzing: cars in the street, students on the sidewalks, planes in the sky. Alex Rodriguez, from the Yankees, was holding court at the next restaurant over, regal in gold-tinted shades. I was sitting with the photographer Shannon Taggart, talking about one of her recent subjects: an ectoplasmic medium named Gordon Garforth. Garforth is a spiritualist. His religion, a product of the American nineteenth-century, holds that death is not the end of consciousness. For him, there is an eternal world of “spirit,” and certain gifted individuals, mediums, are capable of conveying messages and energy from the other side. Some can even manifest various physical substances and effects, broadly identified as “ectoplasm.” When he enters a trance, Garforth told Taggart, “You’ll see masks spilled over my face. You’ll see my hands change.” It was just how the spirits worked for him. Taggart was skeptical. “I’m thinking, ‘Okay. Well that could mean many things,’” she said. “I didn’t go into his séance expecting anything. I got to sit in the front row, about six feet away from him.” She kept a camera on her lap. Physical medium Gordon Garforth with enlarged hand. Taggart’s photographs have appeared in outlets such as Readers Digest, Discover Magazine and the New York Times. She’s captured dance auditions and artists’ portraits. Her approach is often unusual, and frequently relies on long exposure times, producing hallucinatory doublings, strange auras and smears of motion as her subjects move. When she photographed Garforth, the long exposure was mostly done to compensate for a lack of light. The resulting images are jittery and blurred — Garforth moved around. They also show the medium holding up a single, grotesquely inflated hand. “I had that experience of seeing that hand get large,” she explained. “I don’t know how it happened. Whether it’s a hand actually getting large in front of my face and I was creating a photograph that documented it, or whether it’s that I was tricked somehow or I had a hypnotic experience and then my camera, through its dysfunction, mimicked that experience… I mean, all of those are interesting perspectives. I love that they’re all there.” She’s been catching similarly ambiguous situations for over a decade. Driven by this strange incident, Taggart had a formal meeting with Lily Dale’s Board of Directors in 2001, asking to make the town the subject of a long photographic project. “I don’t know why, but they just welcomed me with open arms,” she said. Her work in Lily Dale is still ongoing, and many of her images of the place are available on her website. From there she branched out into similar projects covering Vodou rituals in Brooklyn and working with mediums like Garforth. She’s even taken a paranormal investigation course at Arthur Findlay College in England, “the world’s foremost college for the advancement of spiritualism and psychic services” — at least according to its website. Still, Taggart doesn’t consider herself a “believer” — or an “unbeliever,” for that matter. When it comes to spirits and blurry photographs, the discourse often revolved around proof. Both spiritualists and skeptics want for documentary photographers. Physical medium Kai Muegge with ectoplasm. Taggart, however, refuses such classification. “Purely as an artist, going through all the development courses with the spiritualists opened me up immensely,” she said. “I could not wrap my brain around how you could be a sane person and talk to dead people.” At the same time, however, she didn’t enter this new world with an intent to debunk. “I didn’t not believe,” she said. Whether her images are of ghosts or frauds or camera errors doesn’t matter much to Taggart — what counts isn’t the exterior world they capture, but the interior world they provoke. It’s this occult perspective she tries to capture in her images of spirit visitation. “It’s impossible to photograph this stuff conventionally because the interior element is so huge,” she said. “It’s unphotographable.” Nonetheless, lengthening exposures and allowing other products of “accident and error,” into the work allowed Taggart to photograph it. “I’m not really looking for proof,” she said. “I’m looking to go deep into the experience.” Think of Garforth and the big hand — whatever explanation you prefer, Taggart’s images capture her experience precisely. I found them deeply unnerving. This artistic approach makes Taggart an enigma to skeptics and spiritualists alike. According to her, trusting photography to either prove or disprove the existence of spirits — or anything else, for that matter —is wrongheaded. “Photography is much too complicated of a medium,” she said. “It’s a trickster medium. It can be two things at once. That’s what I love about it.” For her, deliberate distortions “give your mind, or the photographic mechanism, something to play with.” They invite interpretation. “Bob was her deceased husband,” Taggart explained. “A week later, I was walking around the town and she drove by me and I heard her telling people, ‘that’s the girl who photographed Bob in the museum.’” Taggart smiled. “I love seeing that as the point where my camera started showing me things – handing me a language to refer to the material.” For Taggart, the images were flawed and forgettable. For Dorothy, however, they had become thick with meaning. A purple splotch had soaked up all her memory and faith and knowledge of the world to come. Who am I, Taggart thought, to get in the way of that? Dorothy with Bob’s orb, Lily Dale Museum. Shortly afterward, she recalled photographing another medium who, like Garforth, operates under a dim red light, necessitating a long exposure. In the séance, “everyone was saying, ‘Oh, I see a woman who looks just like you right next to you, I think it’s your grandmother.’ And then other people were saying, ‘She looks like you, but it’s not you,’” and so on. Taggart didn’t see anything. 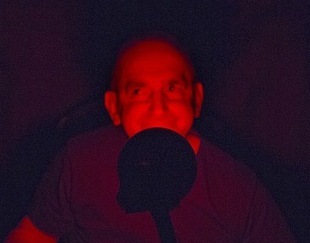 Later, developing images from the session, a perfect duplicate of the medium’s face appeared, connected by a thin, night-highway line of red to the original. Taggart recalls her excitement at the find. “Isn’t that funny? Isn’t that weird? Isn’t that coincidental?” she asked. It was a distortion produced by motion and the long exposure, sure — but it was something else, too. Since then, Shannon has maintained her photographs’ two faces in parallel. Artistically speaking, it’s paid dividends. Some of her most arresting images will see print this month in the first Morbid Anatomy Anthology. Her lectures on the topic are in high demand. Don Jolly is a Texan visual artist, writer, and academic. He is currently pursuing his master’s degree in religion at NYU, with a focus on esotericism, fringe movements, and the occult. His comic strip, The Weird Observer, runs weekly in the Ampersand Review. He is also a staff writer for Obscure Sound, where he reviews pop records. Don lives alone with the Great Fear, in New York City. He writes a monthly column for The Revealer called “The Last Twentieth Century Book Club” which you can read here.